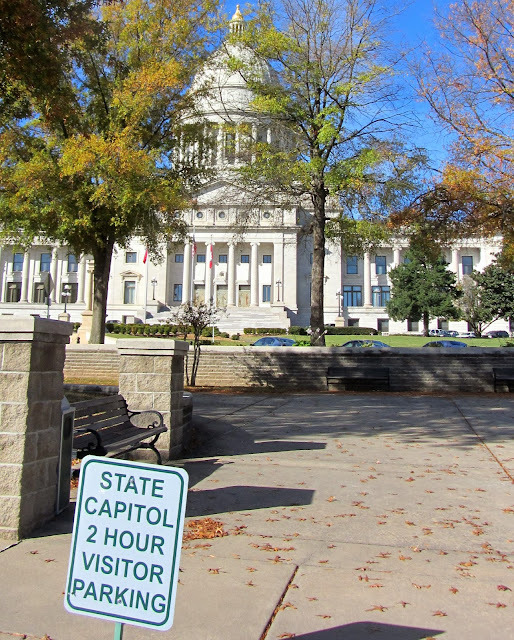 In our continuing quest to explore state capitol buildings, we charted our course to take us through Little Rock, whose entire state government was experiencing a snow-driven shutdown when we tried to visit the statehouse last December. 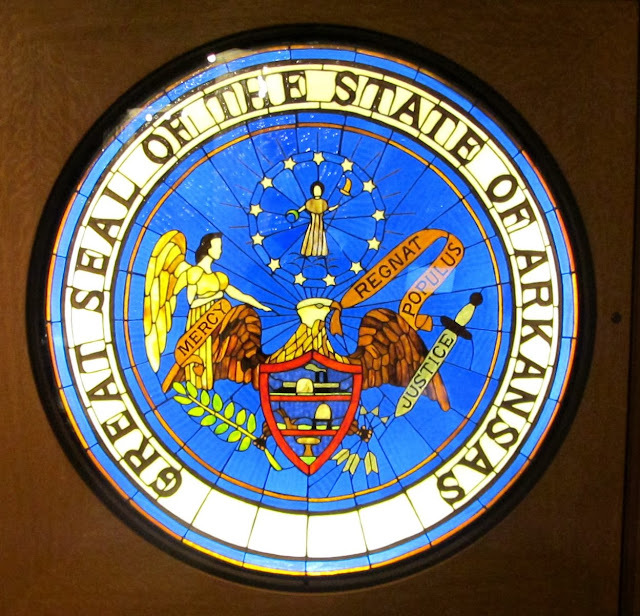 Today, the weather gods were smiling on us and on the early 20th century Neoclassical Arkansas center of government. 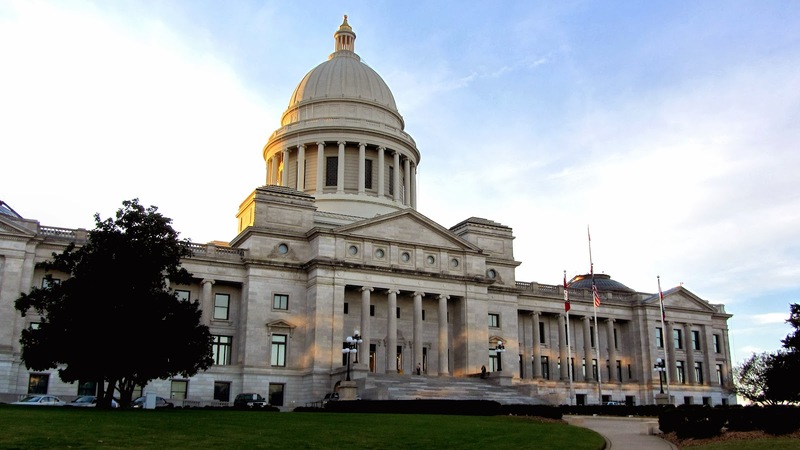 From its conception, the current Arkansas State Capitol was plagued by controversy. 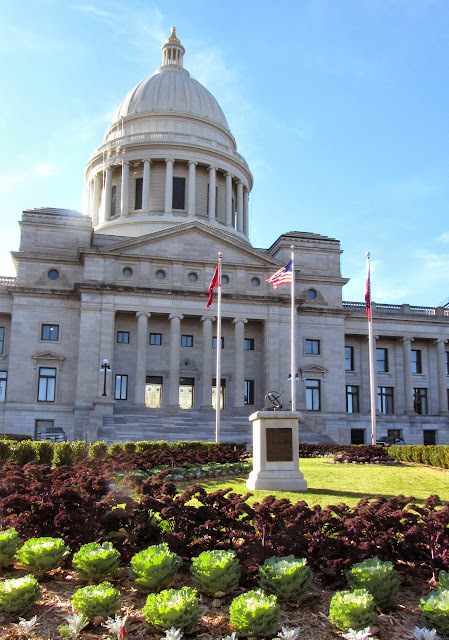 By the end of the 19th century, it had become evident that the state government had outgrown its 1842 statehouse, but the legislature was loath to approve funding for construction of a new building. Then one fateful day in 1899, weather intervened. 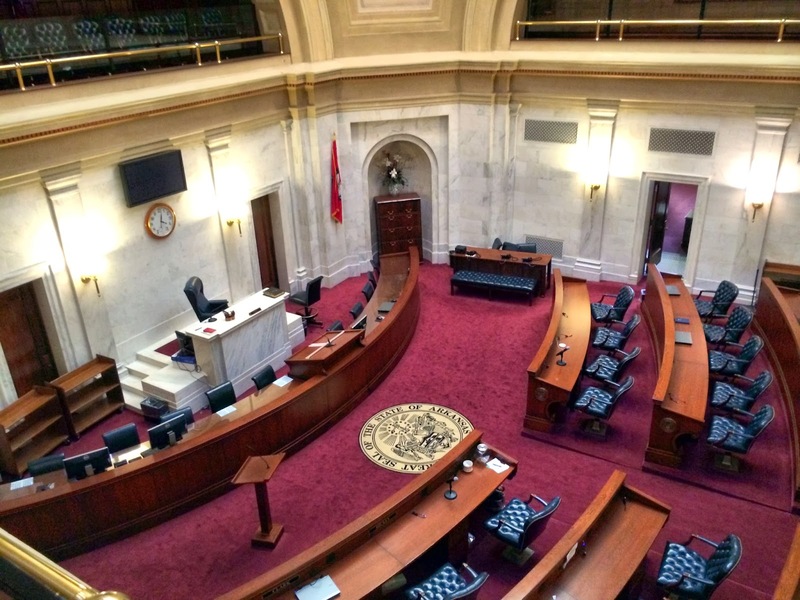 On the same day that a heavy downpour sent large chunks of already weakened plaster raining down on senators' desks, lawmakers finally decided to authorize a new capitol. 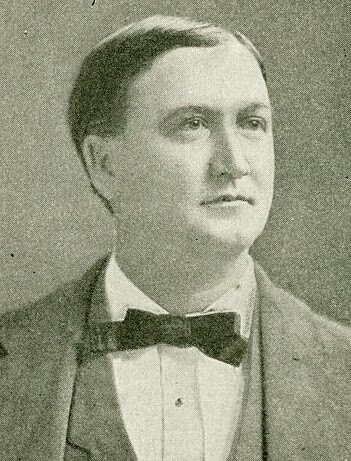 Despite Davis's efforts, construction on the statehouse resumed in 1904 amid disputes between suppliers, contractors and the government agents charged with overseeing the project. Delays, poor material quality, and shabby workmanship were alleged, and in the process six state senators were charged with bribery (one convicted). 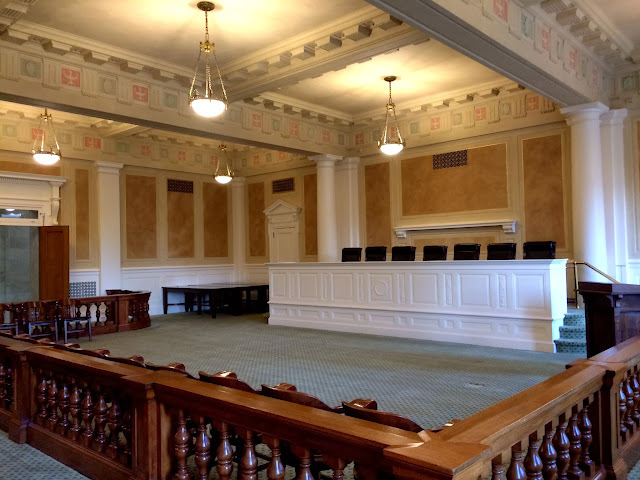 Ultimately, all parties involved—architect, contractors, and capitol commission—were dismissed when the building was deemed unsafe. Contractors' efforts to maintain control over the construction site by sealing off the building were thwarted when state officials turned repo men, broke into the building's front entrance and sent the hired security team packing. 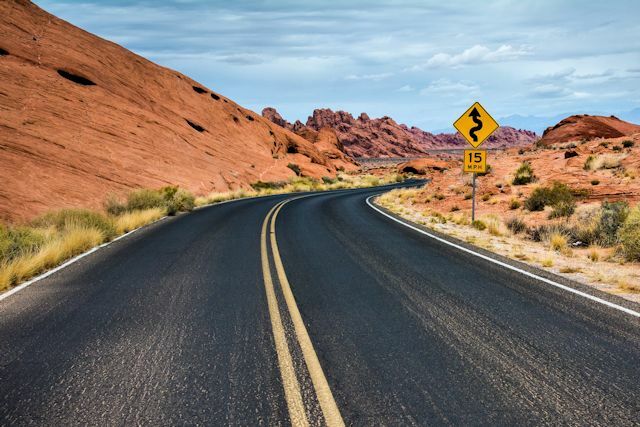 The government threw up a fence manned by armed guards to prevent future encroachment, and a new architect and contractor were hired to finish the job. Much of the half-completed interior had to be torn out and rebuilt due to construction shortcuts. 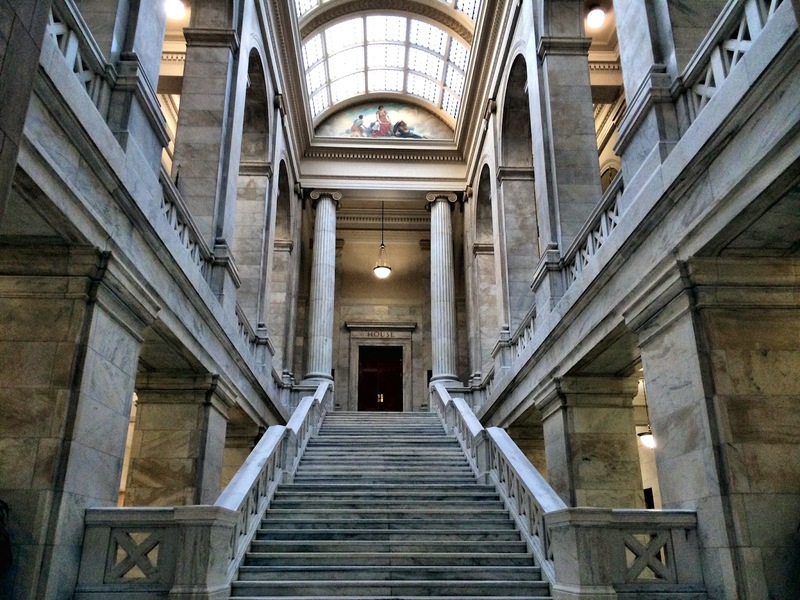 The legislature finally occupied the building in 1911, and from there appropriated sufficient funding over the next four years to complete the project in 1915. 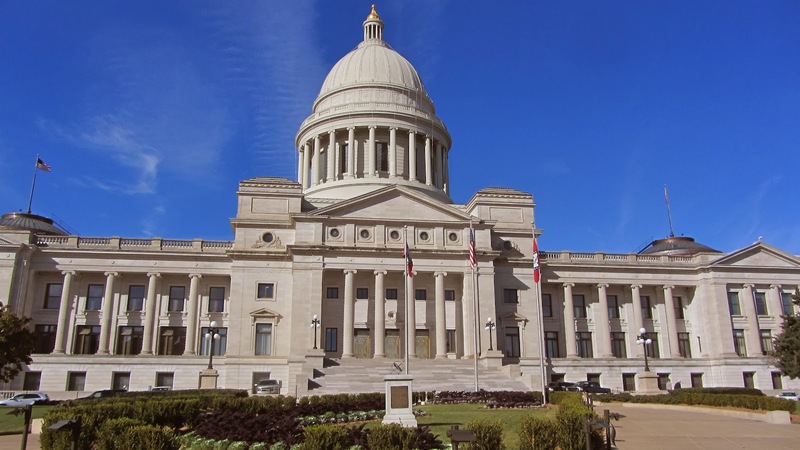 Final construction costs were almost 2.5 times the original $1 million cost cap stipulated in the authorizing legislation. Over the course of 16 years, two architects, two general contractors, six capitol commissions and three governors had a hand in its completion; some also had their fingers in the pie. Of necessity, our first encounter with a statehouse is usually the parking situation. 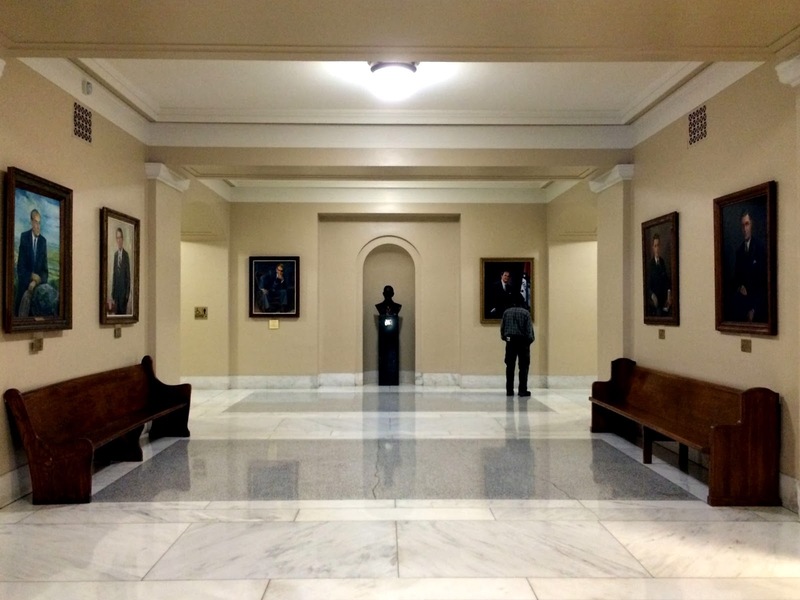 With 15 capitol visits behind us, we've seen the gamut from a few feet away from the entrance to many blocks distant. Arkansas scored well on the parking meter with free two-hour parking just across the street from the main entrance. Since two hours is the length of our typical visit, this suited us well. The security screening for the Arkansas State Capitol was less than cursory. The friendly guard at the first floor door (no entrance through the bronze main doors) asked us to step through the metal detector, carrying all our belongings. When all our electronics predictably set off the alarm, he took a glance in my bag and waved us in. Unexpectedly, the first sight we encountered after passing security was the rotunda chandelier. 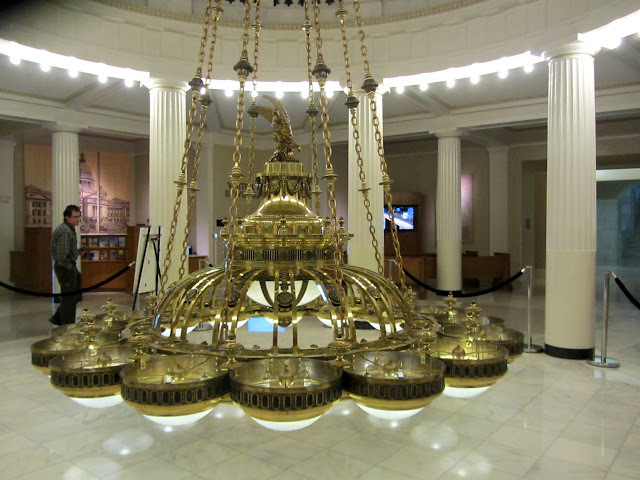 Twelve feet in diameter and 18 feet tall, the light fixture and its chain weigh in at more than two tons. In July of this year, the chandelier was lowered to a position on the first floor to make way for a dome restoration project. Though scaffolding shielded the dome and rotunda from view, we certainly had a closer look at this exquisite fixture crafted by Mitchell-Vance clockmakers of New York than most visitors do. With the project all but complete (except for the removal of scaffolding), we could have an opportunity to view the rotunda and the dome in all their restored glory if we were only staying another ten days or so. 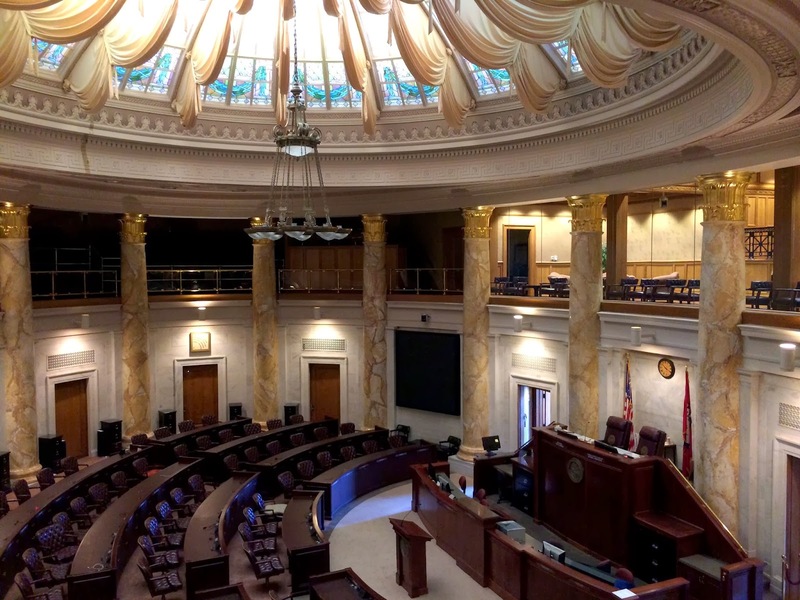 As in the Mississippi Capitol, both legislative chambers are circular, each topped by a saucer dome with a skylight. 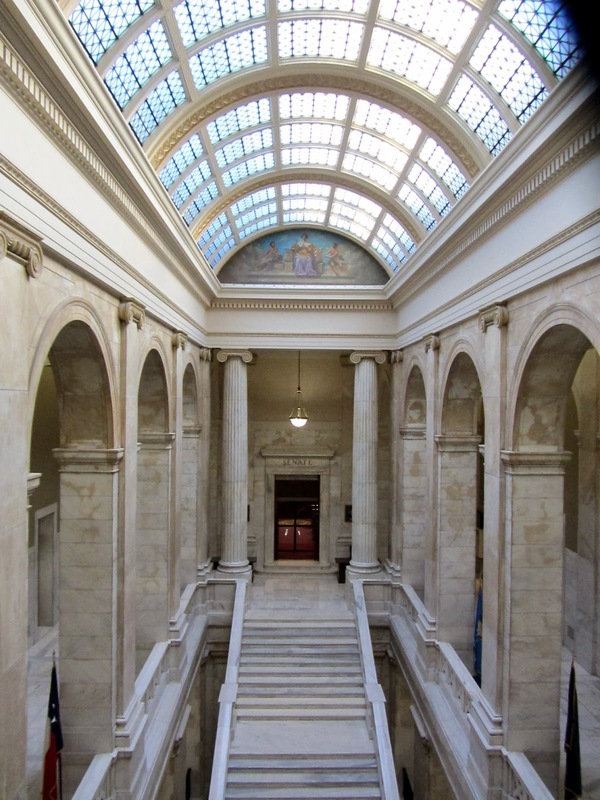 From the first days of occupancy, legislators complained about the glare from the large skylight and poor acoustics in both chambers. 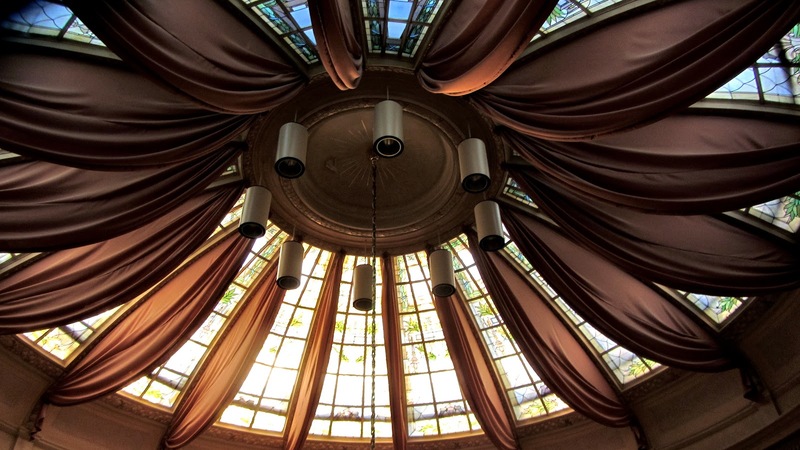 In 1914, the transparent skylight panes were replaced with stained glass to reduce the sun's glare. Draperies were hung between each section of the skylight, and though they look attractive, they apparently failed to mitigate the sound problems. With extensive use of white marble on the floors and walls, corridors and grand staircases radiate an elegant monochromatic splendor which is enhanced by the dearth of traditional portraiture and sculptures typical of statehouses. 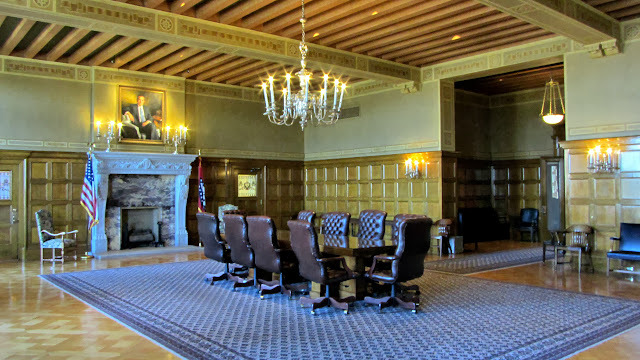 Following the self-guided tour brochure, we wandered into the State Treasurer's office on the second floor. What a surprise awaited us there. When we walked in, we were greeted by a friendly department employee who asked if we wanted to go into the massive vault. Momentarily we pondered whether it was a trick question. Did we inadvertently park in an illegal spot? Did the security guard find something suspicious in my backpack and send word ahead? But the lady seemed so sincere, we readily agreed. 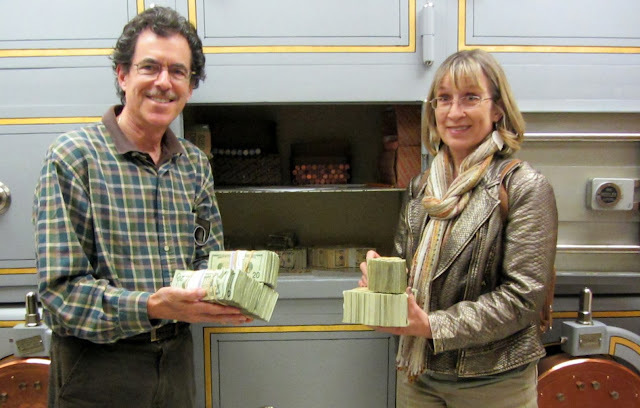 When we were inside, she asked if we wanted to hold $150,000. 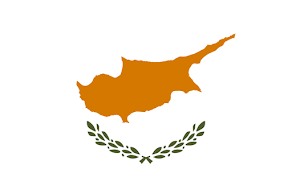 For the next ten years or so? we wondered. Then we saw the other employee with a camera and began to understand what was going on...sort of. Apparently this is a tourist "service" the office provides to visitors. I was handed bundles of $100 bills which were said to total $150K and Ken held an alleged $24,000 worth of twenties. Quickly assessing the situation, we saw no means of escape with the cash, so we dutifully handed it back and accepted our souvenir coins engraved with the likeness of the capitol building and the name of Charles L. Robinson, Arkansas State Treasurer. What a convenient way to produce campaign materials at taxpayer expense. Not cool, Chuck! Out front, we admired the stunning entrance doors. 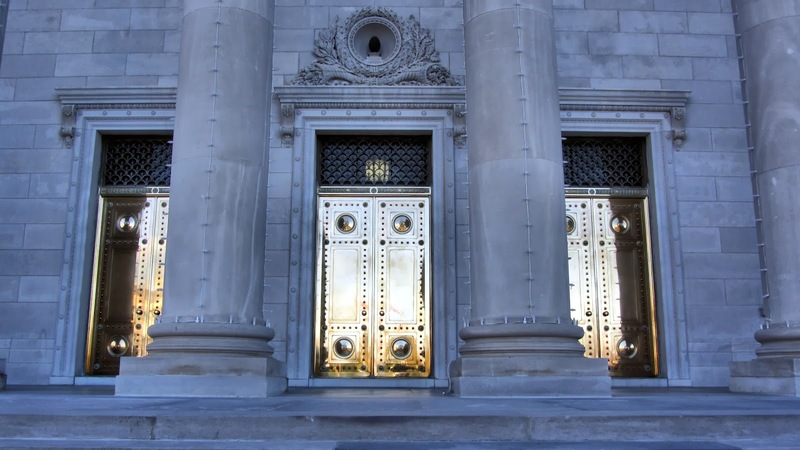 For a tidy sum of $10,000, Tiffany's sold the state six 10-ft tall bronze doors in 1910. No doubt they would fetch quite a bit more today should the state ever need to auction them off. 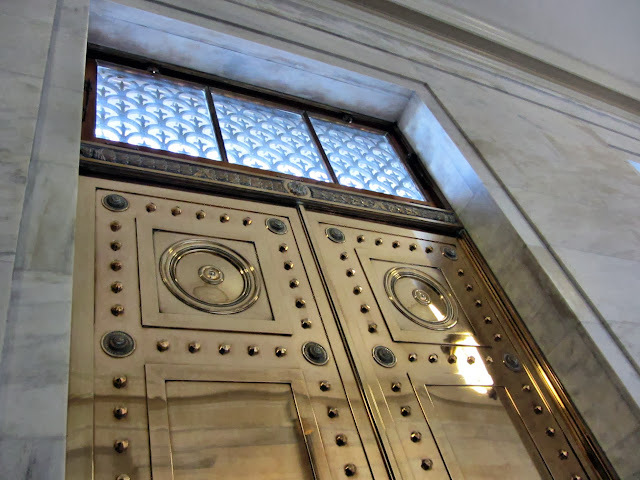 Building maintenance constantly works to keep these jewels sparkling and fingerprint free, their efforts greatly aided by the fact that the doors are no longer used on a regular basis. 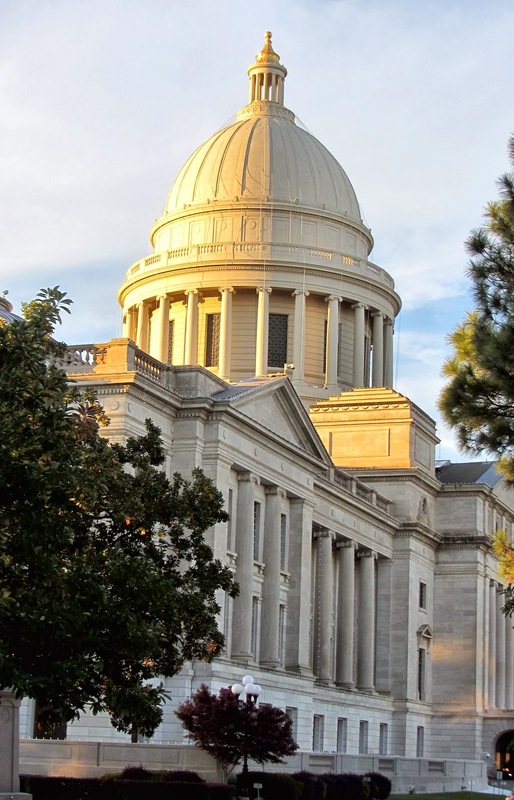 Like Mississippi's statehouse, the Arkansas capitol building occupies land where the state penitentiary once stood. 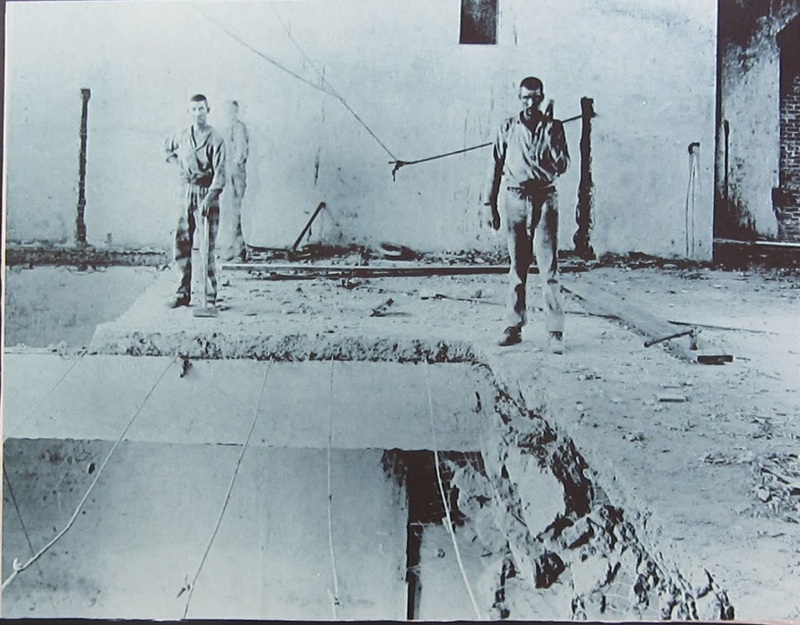 Since the prison was still on site when construction began in 1899, the state took advantage of the "free" labor afforded by the inmates, who lived in a unit left on capitol grounds during construction. 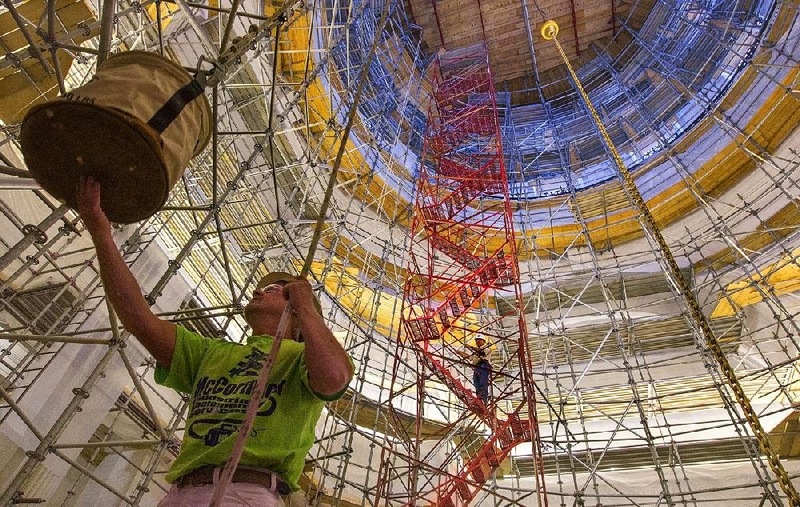 Convicted felons earn their keep doing construction work. With the legislature and governor still in residence, along with numerous executive departments, the Arkansas State Capitol remains a vital working building as well as an historic landmark, despite Jefferson Davis's efforts to block its construction. Because of its resemblance to the U.S. Capitol, the exterior of the Arkansas statehouse has been used as a Hollywood double for the national capitol in several movies. We found it to be a handsome structure in its own right.